Over the past couple months the SLO County Food Bank and GleanSLO have been collaborating with the UC Cooperative Extension to offer Canning Workshops throughout SLO County! 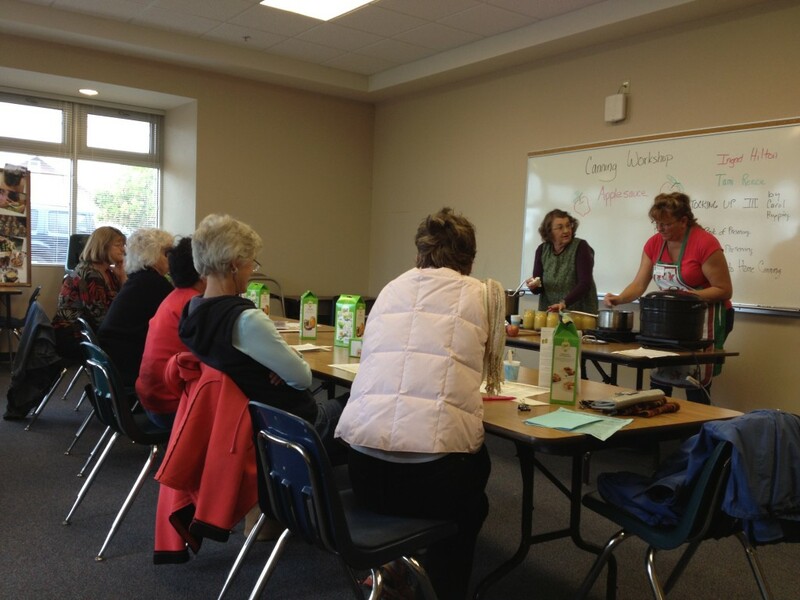 We’ve begun our first round of workshops with a demonstration on how to make and preserve applesauce. What a great way to celebrate fall! GleanSLO has already donated a variety of gleaned apples, which were made into tasty applesauce for attendees to sample at the past two workshops in San Luis Obispo and Oceano. If you were unable to make it to the first two, don’t worry! 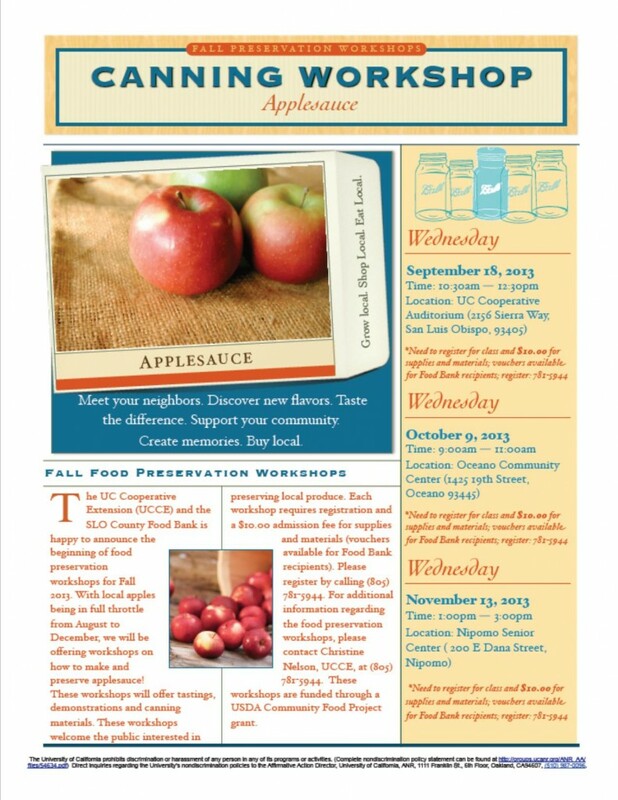 There’s still one more opportunity to participate in the next Applesauce Canning Workshop in Nipomo on November 13th from 1-3 pm at the Nipomo Senior Center! Please contact Christine Nelson at the UCCE, (805) 781-5944 or cinelson@co.slo.ca.us, to register for the $10 class. Supplies and materials provided; vouchers are available for Food Bank recipients. Attendees at the Oceano Canning Workshop hosted on October 9th, 2013 at the Oceano Community Center. This entry was posted in Events on 10/22/2013 by gleanslo. 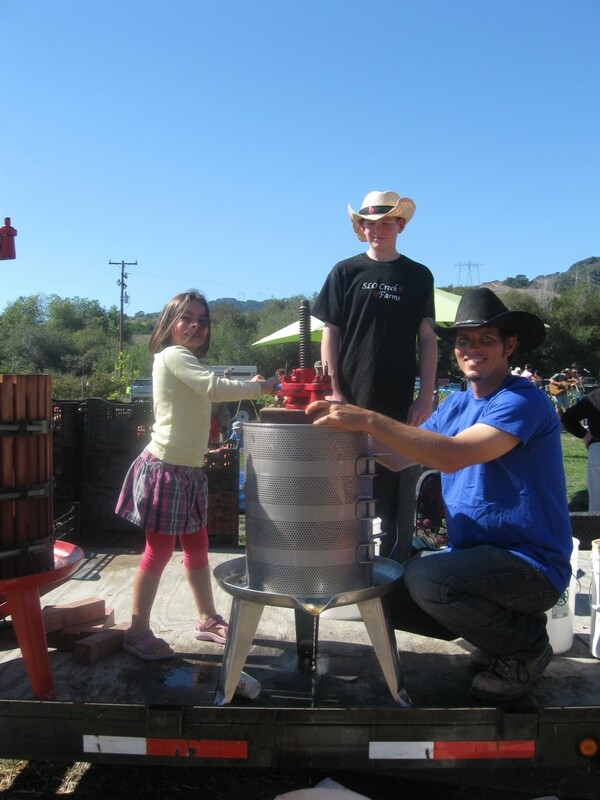 Fun for the whole family at SLO Creek Farm’s Apple Harvest Festival! Old fashion apple cider press at the 2012 Harvest Festival! SLO Creek Farms will be hosting their annual Apple Harvest Festival Saturday, October 2, 2013 from 1:00pm to 4:00pm! Join us at SLO Creek Farms U-Pick Garden Area, 6455 Monte Rd San Luis Obispo, CA 93401, for live music, apple pie contest, tractor rides, games and FREE cider, freshly pressed right before your eyes! Bring your own empty 1/2 gallon jug and help pick some apples off the trees for the cider press. All proceeds donated will benefit GleanSLO! Check out the itinerary and website for more details about the day! This entry was posted in Events on 10/07/2013 by gleanslo.